The aim of the present Methodological Guidebook is to deepen our knowledge of such groundwater systems, fostering a collaborative, equitable and sustainable management of these resources. It first recalls the main issues at stake regarding transboundary aquifers and the need for a more comprehensive approach based on IWRM principles. It then describes some existing tools that can help in improving our knowledge and management of these precious resources; this includes technical, legal, organizational and economic tools, as well as training and cooperation tools. 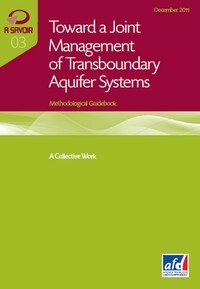 Finally, it proposes a progressive, multi-pronged approach for implementing the collaborative, equitable and sustainable management of transboundary aquifer systems. It also takes a look at the potential mechanisms for creating and sustainably operating an appropriate institutional structure to manage these shared groundwater resources.